Prep for the holiday show is underway! The Beehive Bazaar with be hosting an amazing and talented collection of artists and crafters this Christmas. Over the next few weeks we'll give you a preview of the handmade, unique, ecclectic, -can't buy it anywhere else-, goods and gift possibilities that will be available. Mark your calenders, plan a trip to Provo...it's going to be fabulous! 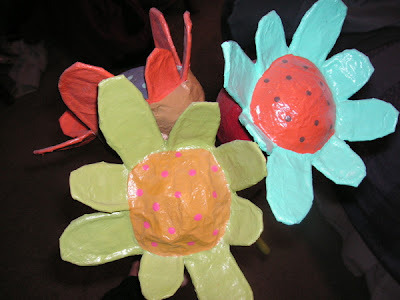 For now, here are some paper mache flowers from a few shows back. While these exact flowers won't be available, I have seen Molly's new designs and I can't wait to get my hands on a few!